Ashraf El-Kereamy was appointed UC Cooperative Extension citrus horticultural specialist in the Department of Botany and Plant Sciences at UC Riverside on Feb. 1, 2019. He is based at the UC Lindcove Research and Extension Center in Exeter. El-Kereamy had been working as a UCCE area viticulture advisor serving Kern, Tulare and Kings counties since 2014. Prior to joining UCCE, El-Kereamy was a post-doc research associate at University of Guelph in Ontario, Canada, studying plant drought and heat stress tolerance in plants from 2013 to 2014, and studying the genotypes variation in nitrogen use efficiency and plant heat stress tolerance from 2008 to 2012. From 2012 to 2013, he was assistant/associate professor in the Department of Horticulture, Ain Shams University, Egypt, where he taught undergraduate and postgraduate courses for horticultural science and served as the principal investigator for a U.S.-Egypt joint collaborative research project between University of Wyoming and Ain Shams. As a post-doctoral scientist at the University of Guelph, El-Kereamy studied the pathogenesis-related proteins during plum fruit ripening. As a University of Manitoba post-doc, he studied the physiological role of abscisic acid in plants. El-Kereamy earned his doctorate degree in agriculture with an emphasis in grape physiology and molecular biology at Toulouse University, in France, and a master's degree in pomology and bachelor's degree in horticulture, both from Ain Shams University, in Cairo, Egypt. El-Kereamy can be reached at (559) 592-2408, cell: (661) 703-4678 and aelkereamy@ucanr.edu. Follow him on Twitter at @ashrafelkereamy. Giuliano C. Galdi joined UCCE on Jan. 2, 2019, as a UC Cooperative Extension agronomy advisor in Siskiyou County. Prior to joining UCCE, Galdi was a junior specialist at UC Davis, where he worked on a variety of field trials aimed at improving sustainable water use and hay quality. Tasks included irrigation scheduling, planting/harvesting trials, and data handling and analysis. As a master's student and student research assistant at Fresno State, Galdi evaluated salinity tolerance in different alfalfa varieties and presented research in the form of posters and talks. He speaks Portuguese fluently. Galdi earned a master's degree in plant sciences from Fresno State and a bachelor's degree in agronomy engineering from University of Sao Paulo, Brazil. Galdi is based in Yreka and can be reached at (530) 842-2711 and gcgaldi@ucanr.edu. Follow him on Instagram and Twitter at @uccesiskiyou. 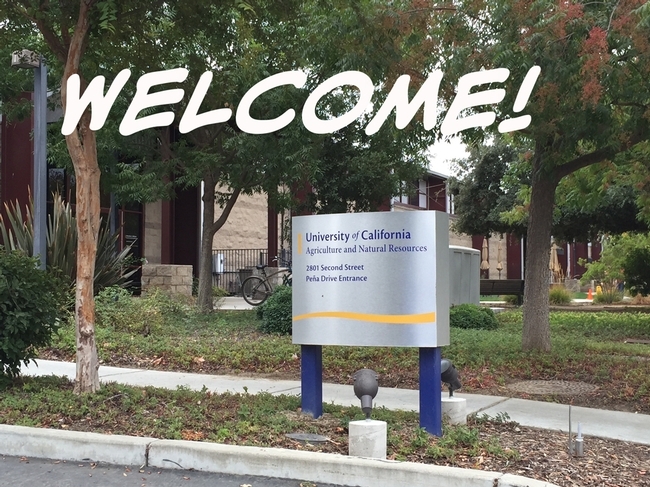 Ian Grettenberger joined UCCE on Jan. 2, 2019, as a field and vegetable crops assistant specialist in the Department of Entomology and Nematology at UC Davis. Grettenberger is interested in advancing integrated pest management in field and vegetable crops, plant-insect interactions, and applied insect ecology. Grettenberger earned a doctorate degree in entomology from Penn State University and a bachelor's degree in biology from Western Washington University. Prior to joining UCCE, Grettenberger was a postdoctoral research scholar at UC Davis, working first with UCCE entomology specialist Larry Godfrey and then UCCE entomology specialist Frank Zalom. Grettenberger is based at UC Davis in Briggs Hall and can be reached at (530) 752-0473 and imgrettenberger@ucdavis.edu. Follow him on Twitter at @IGrett. Yu Meng joined UC Cooperative Extension on Jan. 2, 2019, as the youth, families and communities advisor serving Imperial County, UC Desert Research and Extension Center and communities near the U.S.-Mexico border. Her responsibilities will focus on providing community development programs in the area of youth, families and communities, with major outreach to Latino youth and families. Prior to joining UCCE, Meng worked for a USDA-funded project known as "the WAVE~Ripples for change" in collaboration with Oregon State University professionals, extension, community partners, high school soccer coaches, school districts and other volunteers. The program was designed to prevent unhealthy weight gain among 15- to 19-year-old soccer players. Most of the youth she worked with were Latinos and from low-income families. During this time, Meng helped develop and test the first sports nutrition, physical activity, family and consumer sciences curriculum for active youth. Her work resulted in positive developments in youth, reducing added sugar intake, maintaining fruit and vegetable intake over time, and improving the awareness of sports nutrition. Participating youth also applied additional skills they learned from gardening and cooking workshops at their homes, and shared the lessons and practical applications with their families. Meng is fluent in Chinese and originally from China, where she worked for food industries and started to notice the nutrition issues with processed foods and their effects on children's health. With that in mind, she came to the U.S. and studied nutrition. She completed a doctorate degree in nutrition science from Oregon State University, a master's degree in food science and nutrition from Utah State University, and a bachelor's degree in food science and engineering from Southern China University of Technology, China. Meng is based in Holtville and can be reached at (442) 265-7700 and ucmeng@ucanr.edu. Beatriz Nobua-Behrman joined UC Cooperative Extension as an urban forestry and natural resources advisor serving Orange and Los Angeles counties on March 25, 2019. As a UCCE staff research associate in Orange County since 2017, Nobua-Behrman provided management and direction to conduct a research and extension program focused on the impact of invasive insects on urban landscapes and wildlands surrounding urbanized environments. The main focus of the program was to conducting surveys of infestations in regional parks and open spaces in order to develop management strategies that are efficacious and economically feasible. Nobua-Behrmann completed bachelor's and doctorate degrees in biology from the University of Buenos Aires in Argentina. Nobua-Behrman is based at the UC South Coast Research and Extension Center in Irvine. She can be reached at (949) 301-9182, Ext. 1006, benobua@ucanr.edu. Ryans Tompkins joined UC Cooperative Extension as a forestry and natural resources advisor on March 18, 2019, serving Plumas, Sierra and Lassen counties. Prior to joining UCCE, Tompkins held forester positions with the U.S. Forest Service, worked in the fire effects program with the National Park Service and served as associate faculty in the Environmental Studies Department at Feather River College, teaching forest ecology and management. Most recently, Tompkins served as the forest silviculturist and vegetation program manager at the Plumas National Forest, where he designed, planned and implemented landscape-scale forest restoration projects. Tompkins earned master's and bachelor's degrees in forestry from UC Berkeley. Tompkins can be reached at (530) 83-6125, retompkins@ucanr.edu. Robert York joined UC ANR on Jan. 2, 2019, as a UC Cooperative Extension silviculture and applied forest ecology assistant specialist and adjunct associate professor of forestry in the Department of Environmental Science, Policy and Management at UC Berkeley. He directs research and management activity on the Berkeley Forests, a network of five research forests covering the western slopes of the Sierra Nevada mixed conifer forest from Shasta to Tulare counties. York is a Registered Professional Forester in California. He earned a doctorate degree in forest ecology and silviculture, a master's degree in forest community ecology and a bachelor's degree in forest management, all from UC Berkeley. Prior to joining UCCE, York has been the research station manager at Blodgett Forest Research Station with UC Berkeley. York is based in Georgetown and can be reached at (530) 333-4475 and ryork@berkeley.edu.